Had a man-to-man talk with Joe Rosa, as I unlocked my bike in front of Arrillaga Rec Center on the Stanford campus. Joe is a stud in Division I cross country. Over the weekend, he and Stanford teammate Maksim Korolev, a grad student transfer from Harvard, ran away from the field at the Stanford Invitational. My soulful talk with Joe was straight from the hip. Though I guess some would say it was straight out of Dave Barry’s Book of Guys. The husband says, “Fine,” and goes back to reading the paper. Of course the wife wants to know more – she wants five years of details, not omitting the tiniest, microscopic minutiae of Jim’s life. She finally manages to drag out of hubby that Jim is, in fact, in prison for committing a major felony. But he’s fine. It was just one of those heartwarming, deeply satisfying, seven-word exchanges of shared feelings that men have all the time. In fact, it was pretty fulsome, considering that Joe chose the more formal “Thank you” – which, as we all know, is Guy Talk for “You’re an old man” – in preference to the simpler “Thanks” he’d opt for if I were fifty years younger. Sadly, women don’t understand how guys talk. They’re all into women’s mysteries and such. They communicate by peering deeply into each others’ faces and vibrating and whispering and reading portents in their eyes. They don’t realize that guys are sensitive, too, and that we have our own mysteries, which we communicate in our own language. Here are a couple of photos I took at the Stanford meet. I believe they illustrate the difference in male and female communication styles. 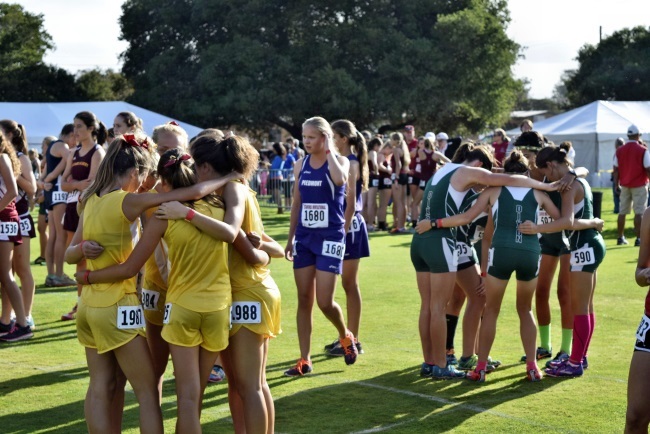 In the first photo, two high school girls’ teams are preparing for their race. It’s a touching scene – well, literally. They’re hugging and blending energies, making sure they’re fully harmonized before they race together as a single body with many hearts. If you look closely at the photo, you can see the pink aura around the hugging girls. Listen closely, and you can hear their astral bodies humming a song of beauty and delicate feelings. It’s possible to over-do the Sisters-Uber-Alles thing. Did you ever wonder why the female runners bunch together communally during the 5,000-meter finals at major meets – “running” barely faster than a jog, while they sync their auras and commune inwardly, becoming a single throbbing mass, never deigning to take the lead lest they break the bonds of sisterhood and hurt some runner’s feelings? Thank heaven for Emma Coburn and Jenny Simpson, the former Colorado runners who’ve broken the estrogenic plasma bubble that keeps their competitors locked in sisterly solidarity. Emma and Jenny, we bow to thee. You’re real women and major running studs. 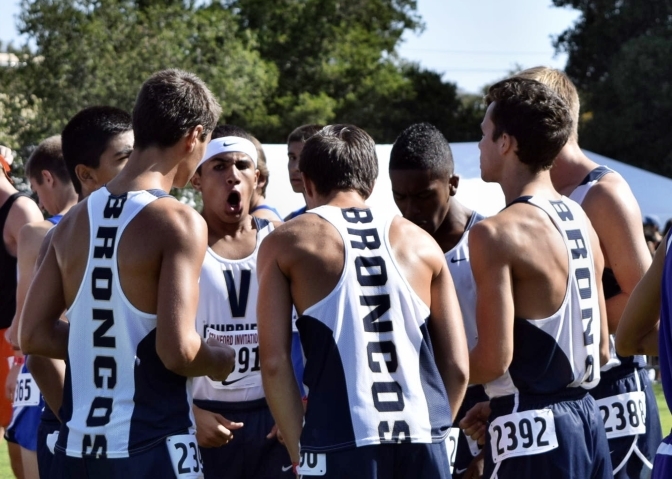 Now here’s a photo of a group of high school guys before their race. Notice that the guys are taking a slightly different approach toward communicating and blending their energies, one that basically involves shouting at a volume that would muffle the sound of steam engines colliding head-on. Still, it’s all very heartfelt and beautiful and touching. Finally, take a look, if you please, at a photo of Joe Rosa and Maksim Korolev taken by your ole lonesome buddy. Any male runner – and perhaps a handful of women poured from the Coburn/Simpson mold – will understand the sensitive, caring, intuitive nature of the photo. 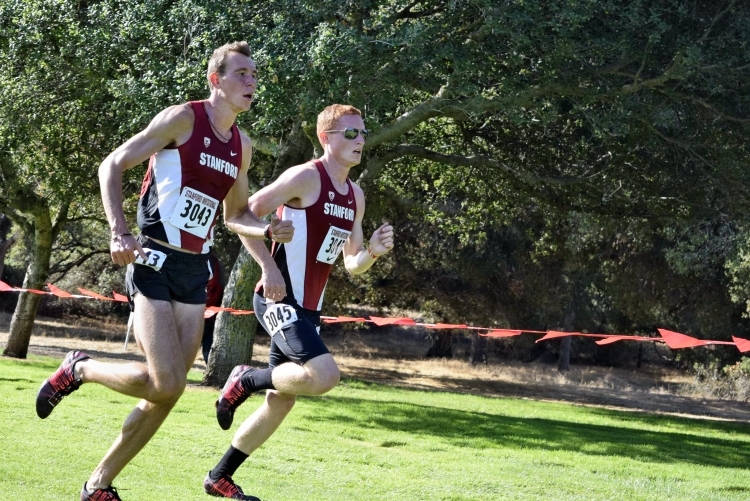 Maksim and Joe run with style at Stanford. Click to enlarge. These guys are vibing success and joy. And like other elites, their example carries mute lessons for dogsbody runners like us, about how to be both good and happy at the same time. The photo tells us (I think) that we can have joy and success equally, and that we don’t have to give up one to have the other. Watching great runners like Rosa and Korolev, I think it might not be inappropriate to think of “rasa running” – running in its most delectable, godlike form. How can we mortals have that experience? Given good health and training, rasa-running requires (again, I believe) regular injections of intensity. Energy, intensity, style – they’re the ingredients. When it comes to learning about intensity, I can commend to you Clarence Bass’s excellent book, Take Charge – Fitness at the Edge of Science. At 76, Clarence lifts weights that would crush me, even though I am a youngster of 72. 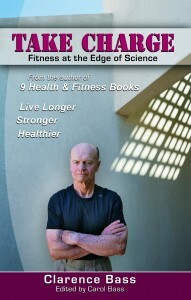 He’s been exercising for 60 years, and he loves learning about what happens inside the exercising body and then sharing his wisdom with others. He’s a rasa man – he’s been highly successful (Mr. America in his age and height class). And he’s a happy, generous guy who likes to help. 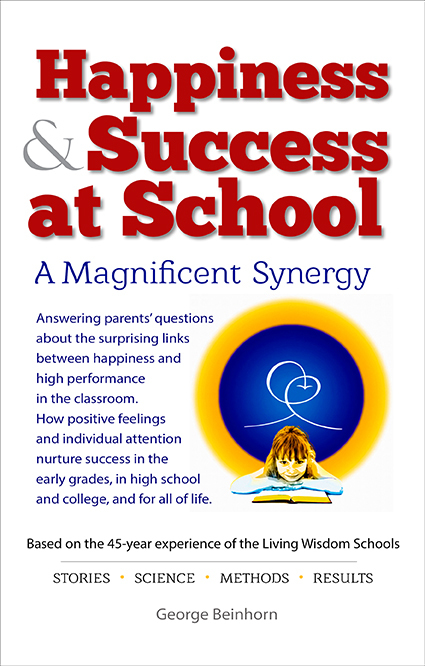 One of the studies he describes in Take Charge is relevant to our search for success and joy. The researchers found that it doesn’t matter if you lift extremely heavy or more moderate weights. What makes us stronger, and does it a fastest, is intensity. There’s been a decades-long argument in the strength world about which approach is more effective for increasing power and muscle size: more reps of moderate weights, or fewer reps of very heavy weights. This study pretty much lays the argument to rest. It seems what you do in the final 2-3 reps of a set is what counts. It’s those final few reps that powerfully stimulate the body to grow stronger. The lovely thing is that you can lift moderate weights, just make sure to do the final 2-3 reps very hard, because it sends a powerful stimulus to the nervous system and muscles. Clarence cites the example of a 140-pound lifter who, goaded into doing a heavy bench press, lifted 300 pounds, after training for years with moderate weights. In the study that Clarence cites, Ralph N. Carpinelli, PhD, of Adelphi University found that what most effectively stimulates an increase in muscle strength and size is not lifting heavy weights but exerting a high-energy effort. 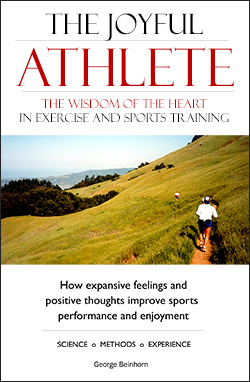 “In fact,” Carpinelli emphasized, “[the] study unequivocally demonstrates the direct relationship between intensity of effort – not the amount of resistance – and voluntary motor unit activation.”…. You can lift heavy or light, low reps, mid-range reps, or high reps. Your muscles will respond the same – as long as the last rep or two challenges your level of strength. Makes sense to me. The secret of success in most things we do is energy. I believe it has applications for runners. In my training, at least, I find it works beautifully. If I sprint hard up a stadium ramp several times at the end of a moderate run, I find I improve. And as a fringe benefit, my mood gets really, really happy. In these articles, I’m always rattling on about how expansion and happiness go together. When we “get more” – get fitter, wiser, or more compassionate, our happiness increases. That’s why “Good run Saturday” held a special meaning for me. It was spoken from the heart. First, because being in the presence of people like Joe Rosa who are dedicated to improving themselves is inspiring. The back story is that, last year, Stanford hired a coach who’s done wonders for the men’s and women’s teams. Chris Miltenberg told Joe and Maksim to burn their butts at the Invitational, even though it seemed they could win with a more geared-down effort. The idea is that a hard stimulus, administered at the right time in our training, wakes up the body and makes it improve. It’s just gravy that it’s exhilarating, too. It’s why Alberto Salazar has his elites do hard workouts just minutes after a race – for example, mile repeats after a record-setting 3K. It seems the excitement and effort of racing prepares the body hormonally to take maximum advantage of training. It’s something we mere mortals probably need to do also, if we want to improve optimally and enjoy it. We need to lay it down on occasion late in the run. In the early 1990s, Carl Ellsworth won the NorCal over-60 road race series three years running. He usually finished his training runs with a hard effort. Three weeks before the Cal International Marathon, our little training group of old fogies ran 21 miles on the American River Parkway at 8:05 pace. Near the end, Carl, at 64, lit up like jet fuel and covered the last quarter-mile at 5:30 pace, while the rest of us looked on with gaping jaws. 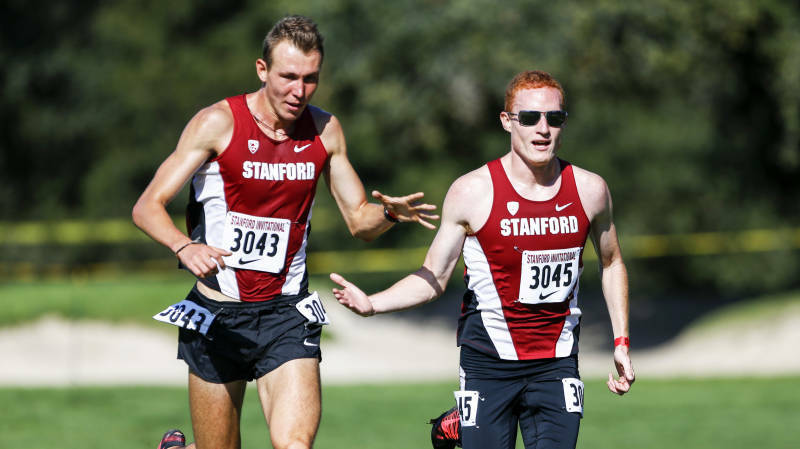 The Stanford teammates ran with mastery. There was iron in Joe’s voice when he thanked me. It reinforced my belief that without a dash of intensity, we’ll rarely enjoy relishable runs.